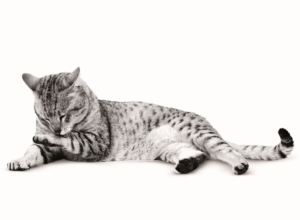 Home » Articles » Why Do Cats Purr? A cat purring is often compared to a human smiling – in actual fact it’s more complicated than that. There are many reasons why cats purr. Purring is low frequency and generally low volume, so while it is a form of communication it’s not one intended for long range. That’s why purring is common in positive social situations where close proximity is a factor – situations like grooming, nursing and, yes, being friendly. While it’s true that purring is often a sign that your cat is contented, that isn’t always the case. Purring is almost always an emotional response – while showing contentment is one emotion purring can express, it can also show pain or distress. Experts have also found that the frequencies produced when purring help with bone regeneration. It’s also been observed that some cats purr while giving birth. This further suggests that purring helps cats to rest and repair. We hope this answered your question about why cats purr. However, if you have another question about purring, feline behaviour, or any other questions about cats then we’d like to help. Submit your question below.